The husband left a receipt on the passenger seat of the car. I idly glanced at it. 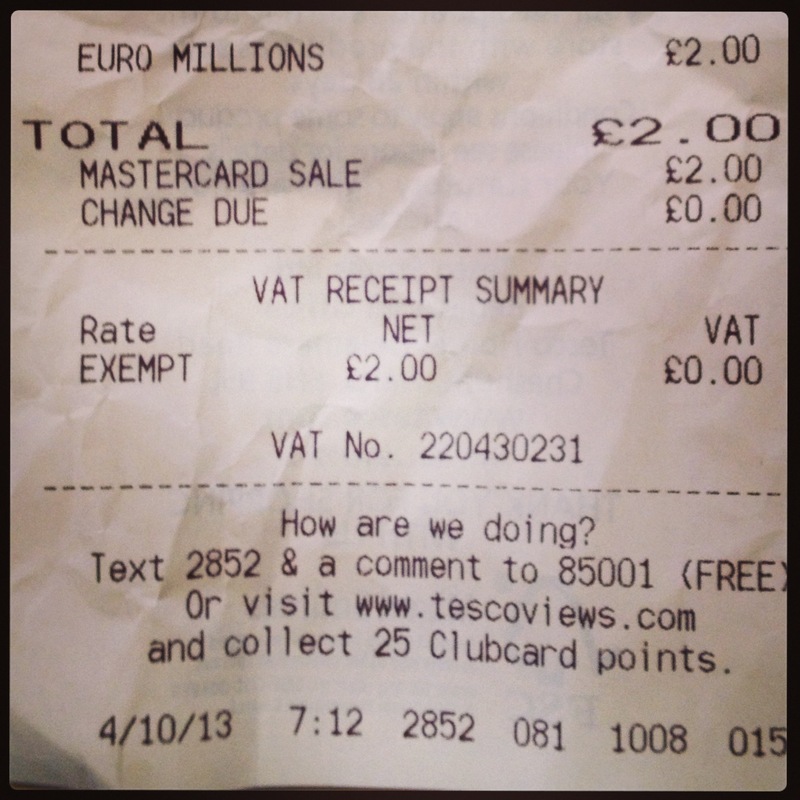 It was a receipt from the local petrol station and said ‘Euromillions £2.00’. To my knowledge, the husband has never bought a Euromillions ticket in his life, let alone at 7.12am on a Friday morning. In fact, the man I thought was my husband wouldn’t do that. Entering the house, I immediately pounced on the husband. ‘What did you buy from the petrol station at 7.12am on Friday morning?’ I said clutching the receipt to my chest and sounding like Miss Marple, uncovering her spouse’s secret gambling habit. ‘A coffee?’ said the husband. I showed him the receipt. We both stared in at it in bemusement. We pondered this for a few moments. ‘He probably chose me as a victim because he knows I’m so gormless,’ said the husband, sadly. I didn’t disagree. ‘I’m going to get to the bottom of this,’ said the husband, fishing £2 out of the loose change bowl and scooping up his car keys. He roared off in the direction of the petrol station.